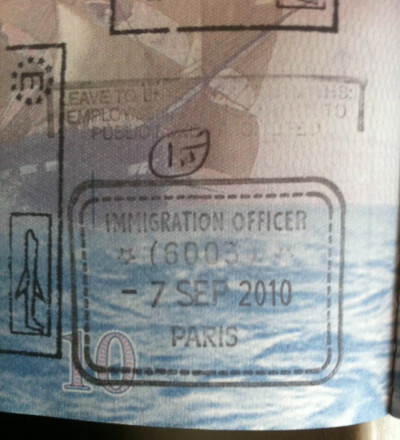 I entered the UK from Paris once (riding the Eurostar train), and after the UK border control officer placed an entry stamp in my passport, he added a notation in pen (picture below). What does it mean? I suspect it is some sort of "warning" (the border control officer was not happy with me, though thankfully did not refuse entry). I've always been curious about what it means more precisely or whether my prediction is even correct. I've entered the UK only once again after getting this stamp. I was admitted then too, but it took a while (the border control officer went away for about 10 minutes to do something before letting me in). This is what they refer to as a 'coded landing'. There is a very brief passage about it in the Wiki article, UK Immigration Enforcement. You can also do a Google search on 'coded landing uk' to see where lots of people have experienced anxiety about them. You can obtain a list of some of the codes using the Freedom of Information Act, others are ad-hoc. Essentially, they are like 'cookies' that are passed between successive Immigration Officers. It's shorthand for something they wanted to pass along. When you returned again, the IO spotted it and then disappeared for a while to access your stuff on the secured workstation. The best advice I can give if someone gets a coded landing is: ignore it. If you are playing things straight up, there is nothing to worry about. Another thing they will write in pen on your stamp is the serial number of your landing card (and more recently, your residence card). They will do this if your visa leads to a settlement status. You can always make a Subject Access Request to find out what your transcript contains, but it will not change anything and they do not have to disclose whatever attracted the coded landing if they don't want to. Also, if you see the IO giving you a coded landing, it's fine to deal with it right then and there. To be specific, you can ask "Would you please explain why I am receiving a coded landing?" Or even "Would you please explain the significance of the stamp you have just used and the amendment(s) you have made on it?" or "Does this stamp contain any information or terms I need to be aware of?". They will explain what they think you need to know and make sure that your understanding is complete (it's their job to do that). If there are lots of people in the queue, they will ask you sit in the secured area until they finish with the other customers. What they will NOT do is change their minds about it. IT means 'in transit'. This is given to passengers who are going to stay in the UK for up to 48 hrs only before leaving again. As this is a code 3 landing the successive IO had looked you up to make sure that you had indeed left the UK previously. As above. 'IT' means 'In Transit'. This helps you 'cos it shows you did not stay in the UK. If you transit the UK frequently and didn't have 'IT' showing it could indicate that you were frequently staying in the UK. Not the answer you're looking for? Browse other questions tagged visas uk passports passport-stamps or ask your own question. Where does my passport get entry stamp?